The Waffle Rock boulder is a strange but not unique example of what is though to be a naturally occurring pattern that makes this particular boulder look like a waffle. Like many of the ancient artifacts we cover here, the Waffle Rock boulder’s origin and creation has been the subject of many theories over the years, including aliens, giant reptiles and even ancient indian carvings. Now standing as an attraction for the public to view in person, the Waffle Rock boulder of West Virginia continues to draw the crowds to this truly ancient artifact, and we plan to provide the neccessary information on this unique artifact for you to make your own decision as to its origin and strange patterning. 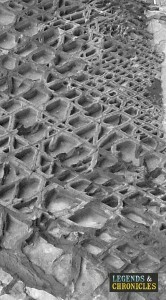 The Waffle Rock has an almost honeycomb appearance, the patterns are very geometrical in shape, but are not exact, even though some of the lines are almost perfectly straight. The lines themselves cross at various degrees forming shapes from triangles to rhombuses, of course making the Waffle Rock look like, well a waffle. The theory on how these strange patterns occurred is obviously part of the unique qualities of the Waffle Rock, and of course over the years, many theories have been thrown out into the wild concerning this unique rock based artifact. 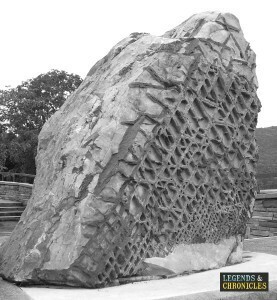 The biggest known Waffle Rock and the one featured in this article is currently on display in Jennings Randolph Lake, Mineral County in West Virginia, USA. The rock has been on display in this location since 1985 and is viewable seven days a week now at the West Virginia Overlook. A smaller piece of the same rock is also on display in another location, this time in the Smithsonian Institute of Natural History located in Washington, DC. So if you do really want to see the famous Waffle Rock, then the United States of America surely have to be your first destination. The theories on the Waffle Rock are varied and a mix of science and creativeness, but this is testament to the visual power of the Waffle Rock and how it triggers the imagination in everyone that witnesses it. We will cover the various theories currently considered in more detail, hopefully giving you the information required to make your own decision on this unique artifact. Some theorists have speculated that the Waffle Rock was created by other worldly life forms, on a visit to earth from far flung planets, and even site radiation burns on the rock itself as a sign of the landing of an alien craft. Others have also suggested that the rock was actually created by man, specially ancient Indians who carved the rock as a form of art or expression. Another very interesting theory is that the rock is actually an impression of an ancient giant lizard that may have lived in the region in prehistoric times. Of course the most logical conclusions about the formation of the Waffle Rock have come from scientists and geologists. The common theory is that the Waffle Rock which is primarily composed from soft sandstone fractured and cracked during the formation of the mountains in Mineral County and these cracks where then naturally filled with quartz. The quartz eventually hardened and formed in the cracks forming the pattern we see today, when the softer sandstone rock was eroded quicker than the much harder quartz rock. The other theory which is truly intriguing is the idea that electromagnetic fields helped form the geometric patterns of the Waffle Rock. Similar to how snowflakes are formed, the geometric patterns of the Waffle Rock could potentially have been affect by a electrical storm at the moment of its creation. Other Waffle Rocks have been found occurring naturally in nature, but as far as we are aware the boulder in West Virginia is the largest known example. Some of the other Waffle Rocks that have been found, were found in Monongahela, Pennsylvania, although these examples were much smaller in size. Not only is the Waffle Rock one of the most visually interesting ancient artifacts we have seen, its also one of the most intriguing. More than likely the Waffle Rock was a present from mother nature, a mix of sandstone and quartz blended together. The Waffle Rock is found in Mineral County, which is wholly fitting and the county itself is known for its amazing natural beauty and the Waffle Rock is now part of that history and beauty.